A configuration space model generates structure realizations from random collections of striations. The defining parameters can be selected to support two-component power-law models. Configuration-space realizations are ideally suited for propagation simulations generated by integrating the parabolic wave equation. A paper has been submitted for publication. The paper investigates the validity of the phase-screen model and two-dimensional propagation for interpreting diagnostic measurements. The blog on irregularity parameter estimation (IPE) introduced a paper that used realizations of a stochastic processes with a prescribed spectral density function (SDF). Such realizations are generated by imposing the square root of the desired SDF on a collection of zero-mean, unit-variance, uncorrelated Fourier modes. Consequently, the realizations are zero-mean and symmetric statistically. Real-world applications generate SDFs from measurements of non-negative statistically asymmetric ionospheric electron density structure or diagnostic electromagnetic wave intensity scintillation measurements. An SDF is formally the average intensity of spatial Fourier transformations of process realizations. The configuration features that distinguish different underlying physical structure defined by the discarded Fourier-domain phase structure. The discarded phase structure structure contains the information that distinguishes different physical processes. A complete statistical description would include a probability density function and higher-order correlations. 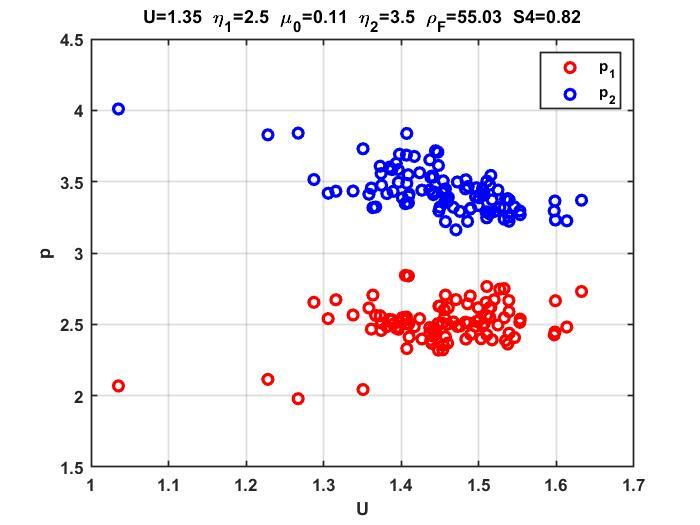 The blog on irregularity parameter estimation also included a report showing that IPE applied scintillation intensity realizations derived from random phase screens recovers the input phase-screen parameters. 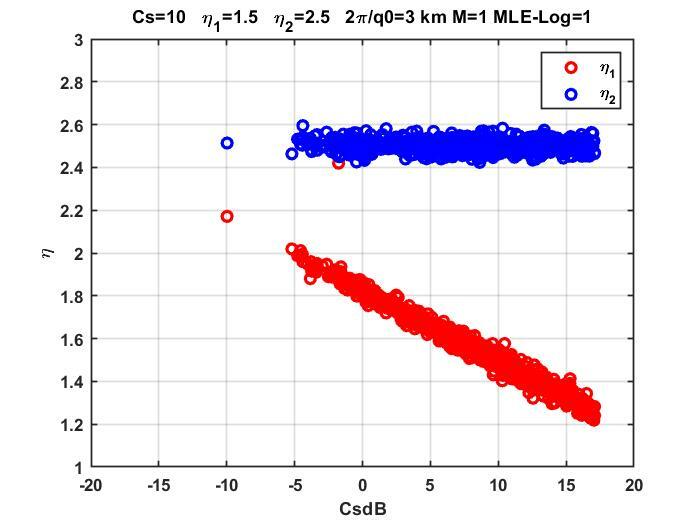 The blog Equatorial Plasma Bubbles reviewed IPE estimates of power-law parameters from physics-based realizations of intense ionospheric structure. The statistical similarity of diverse processes with the same SDF is well established. Even so, it is desirable to generate realizations that are closer to the physical structure of the underlying process. As an alternative to building structure realizations from amplitude weighted random Fourier modes, configuration-space models use random collections of striations. A striation is an ionization distribution tied to individual field lines, basically a radial distribution of ionization with a characteristic strength and scale. The link shows a dramatic visualization of collections of striations that comprise equatorial ionospheric disturbances. In the recently published paper “A Configuration Space Model for Intermediate Scale Parameter Estimation”, we show that three-dimensional realizations of striations can be generated with size and strength distributions that support a prescribed SDF. The left frame in the figure below from the paper shows a cross-field slice of a three-dimensional realization. 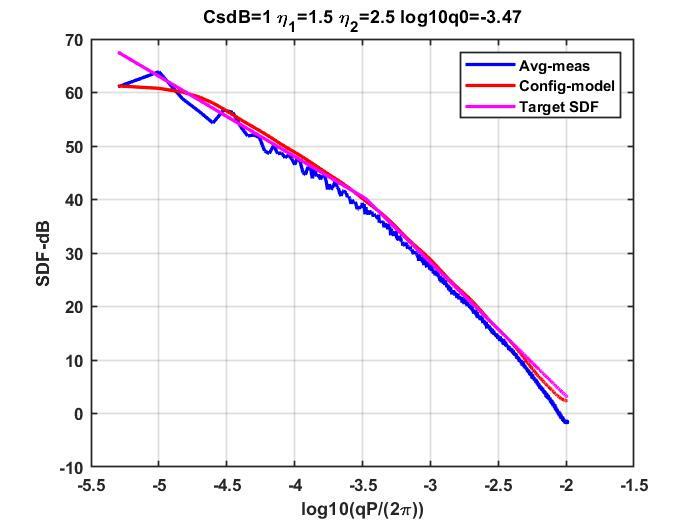 The right frame shows the target theoretical, the expectation theoretical, and measured average one-dimensional SDFs. 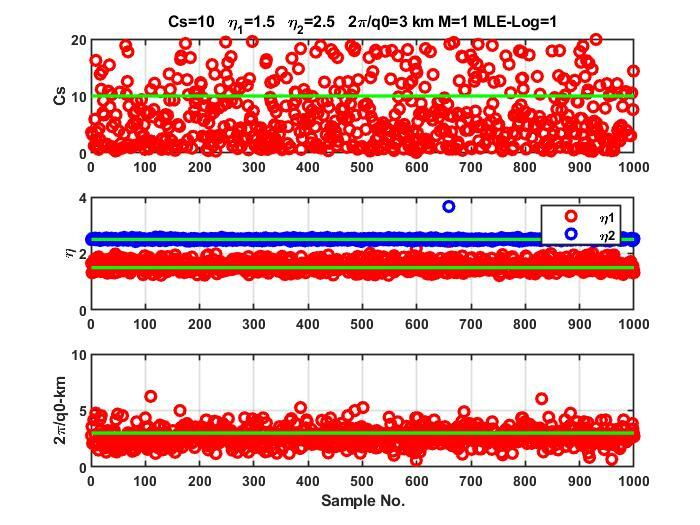 An enduring challenge in characterizing ionospheric intermediate-scale irregularity structure is generating a three-dimensional model. In-situ measurements provide one-dimensional scans, which must be reconciled with a higher dimensional model. Physics-based three-dimensional realizations of the development of equatorial plasma bubbles have been used for some time, but until recent work by Tatsuhiro Yokoyama . Tasuhiro has generously made his high-resolution simulations available for structure characterization. The results are presented in a published paper. The image below shows a perspective view of the three-dimensional structure at a late phase in the development. The stochastic structure is confined to two-dimensional slice planes that intercept the field lines that terminate at low altitudes in opposite hemispheres. Stochastic structure models typically assume an-isotropic structure in three dimensions. However, at some point, the quasi-deterministic field-aligned structure structure become important, which will be addressed in a later blog. The classification in the paper is confined to time and height dependence as measured in slice planes. A graphic examples of the structure development is show in the movie. Irregularity parameter Estimation (IPE) was developed for estimating the intensity SDF from detrended intensity scintillation measurements. As discussed in the blog, the original IPE procedure was replaced with an improved maximum likelihood estimator (MLE). The MLE scheme was also used in the analysis described in the previous blog. A common MatLab library of software was developed for both IPE applications. An unpublished report summarizes the results and describes the describes the library. The first two figure frames below, which are taken from the paper show the four two-component power-law parameter estimates and a scatter plot showing the correlation between Cs and eta1. The higher variability of the Cs estimate is related to the correlation. The second frame shows the parameters derived from fits to the intensity SDF. The excess Cs variabilit and he correlation are gone. However, the intensity parameter estimation is more sensitive to the initiation procedure. The basic structure and dynamics of the ionosphere are captured by deterministic models. At the next level, physics-based ionospheric simulations produce stochastic structure, which is characterized by a statistical model. Statistical models characterize an ensemble of realizations that support well-defined average measures, such as means, higher moments, probability density functions, and covariance. Such models require statistical uniformity, whereas real processes not strictly homogeneous. Analyzing real diagnostic data requires segmentation and averaging. The length of the segment and the sample interval determine the scale or frequency measurement range. Selecting a segmentation requires and assessment of the largest scale that supports statistical substructure. In our 2014 paper Wavelet-based analysis and power law classification of C/NOFS high-resolution electron density data, REF wavelets were introduced because of their ability to measure the variation of the scale over as many scale replications supported by the interval. Scale spectra measure scale versus distance, and thereby provide scale measures and scale dependent uniformity. A classification procedure was then developed to estimate two-component power-law parameters. In a second study the classification procedure was applied to C/NOFS data accumulated over a four-year period REF. It was found that the most highly disturbed passes supported two-component power-law, giving way to a single power-law at smaller disturbance levels. All the classified SDFs showed a correlation between the turbulent strength and the large-scale spectral index. It had also been noted that the correlation was observed in remote diagnostics as well. Because of the persistence of the correlation between the turbulent strength and the large-scale power-law index and some published papers discovered in development of Maximum Likelihood IPE, we began to suspect that the correlation was intrinsic to power-law parameter estimation. A detailed study, which has been submitted for publication, REF, show that this was indeed the case. It was shown further that wavelet-based estimators exaggerate the correlation. The ramifications for the C/NOFS results change mainly the interpretation. The correlation is intrinsic power-law measurements, not a property of the underlying structure. Regarding wavelets, we believe they are useful for identifying segmentation, but should not be used in place of periodograms for IPE. Simplified models that capture the essential elements of physical phenomena are used extensively. The equivalent phase-screen model is a case in point, but the approximation is not overly constraining. As as long as the structure encountered is statistically uniform or slowly varying along the propagation path, scintillation well removed from the structured region is statistically indistinguishable from a full-diffraction simulation. However, two-dimensional propagation is fundamentally different from three-dimensional propagation. For example, phase screens with no variation along one direction launch cylindrical waves, which vary as 1/r. A compelling reason for using two-dimensional models is that diagnostic measurements are time series. As shown in the book Chapter 4, an effective scan velocity converts the time to spatial distance within a two-dimensional field. Propagation from a one-dimensional phase screen generates a one-dimensional field that can be compared directly to a diagnostic data. The two-dimensional phase-screen theory provides a complete model of one-dimensional scintillation from a phase-screen with prescribed power-law parameters. Moreover, there is a closed-form solution for the intensity spectral density function SDF. With a combination of asymptotic approximations and numerical integration, Charlie Carrano developed a very efficient calculation of the intensity SDF REF In the reference he also demonstrated an irregularity parameter estimation (IPE) scheme to find the parameters that provided a best match to a measured SDF. The initial goodness of fit measure was the least squares error of the logarithms of the measured and theoretical SDFs. A more refined Maximum Likelihood goodness-of-fit measure was later introduced REF. 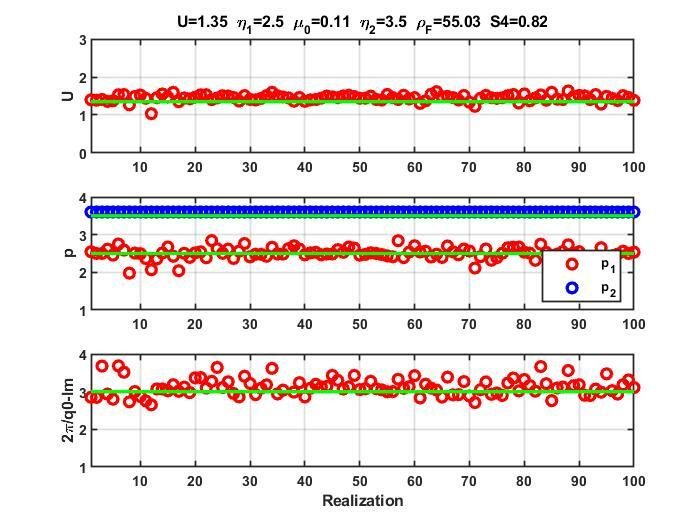 To the extent that IPE generates parameters that match real data, a phase-screen model can be used to generate frequency-dependent scintillation realizations for system analysis. 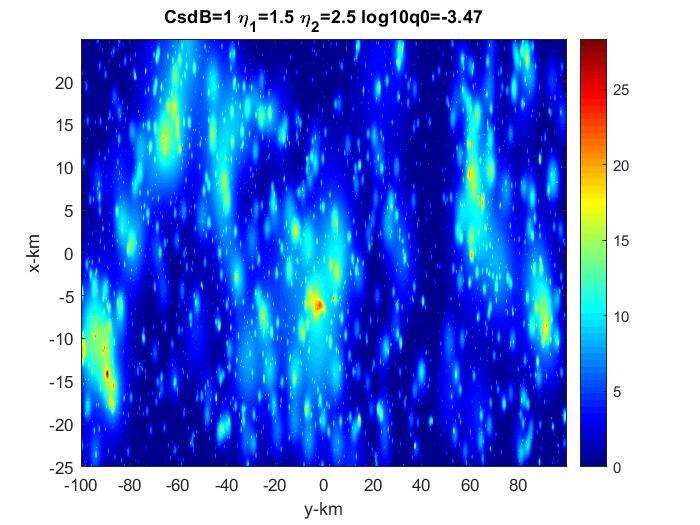 The paper “A compact multi-frequency GNSS scintillation model,” published in the Institute of Navigation Journal describes such a model for GPS scintillation. Cited references demonstrate validation. A MatLab implementation of the model can be down loaded from github.com. This website has been dormant since 2015. The website was started as a platform for discussion related to my book published in 2011. I have removed some of the blogs, which are out of date. Blogs that clarified topics in the book, identified errors, and introduced related topics have been retained. To put this in perspective, the first two book chapters laid the foundation for a complete theory of scintillation, which follows from the forward propagation equation (FPE). Briefly, for propagation studies Maxwell’s equations are used to derive second-order differential equations that characterize electromagnetic (EM) wave propagation, which are known to engineers as the Helmholtz equation. However, the Helmholtz equation characterizes EM fields emanating from a collection of interacting point sources. The problem of interest involves calculating the propagation of an EM field from the phase center of a transmitting antenna to the phase center of a receiving antenna. To put the Helmholtz equation in a more directly applicable form, it is rewritten as a pair of coupled first-order differential equations that individually characterize EM waves propagating in opposite directions along the reference direction defined by the ray connecting antenna phase centers. A well-designed radio transmission and reception system will maximize the energy collected at the receiver. The FPE characterizes the field launched at the transmitter the intercepts the phase center of the receiving antenna. A further simplification calculates time-harmonic fields, which generally capture all that is needed to calculate signal amplitude, phase, and delay perturbations. The FPE is exceptionally well suited for calculating propagation effects induces by ionospheric structure intercepted along the propagation path. Purely statistical models that impose an amplitude weighting on independent Fourier modes. 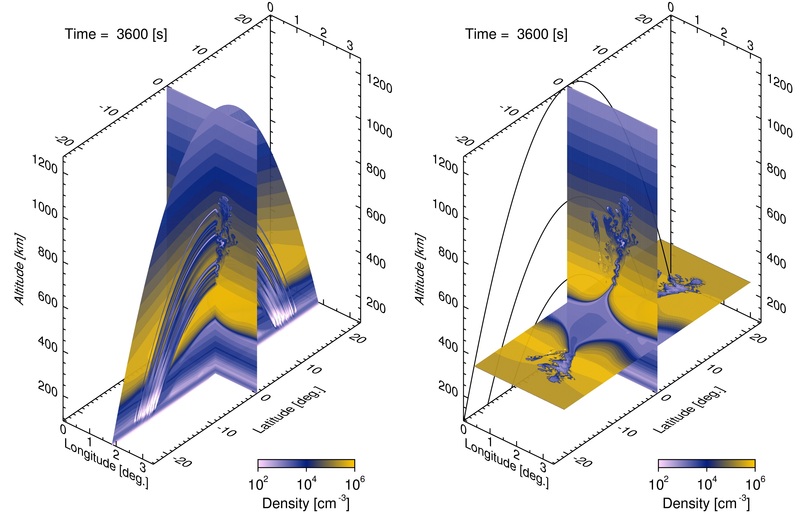 Physics-based simulations of ionospheric structure. Only purely statistical models were introduced in the book. To accommodate field-aligned anisotropy, the spherical isotropic surfaces of constant spatial coherence are transformed into elongated surfaces, generally ellipsoids. Additionally, because the transmission paths of primary interest were from earth-orbiting satellites to near-earth receivers, an ionospheric topocentric coordinate system with downward, northward, and eastward reference axes was introduced. In a downward oriented coordinate system satellite to earth propagation paths intercept the earth’s surface a very large distances from the nadir point. For efficient computation the integration is performed in a continuously displace coordinate (CDP) system that follows the reference ray. Chapter 4 in the book developed all the necessary geometric manipulations. The oblique propagation blog introduces supplemental material to clarifying how CDP coordinates are introduced into moment equations. While scintillation theory follows from solutions to the FPE, characterizing stochastic structure requires statistical measures. Statistically homogeneous processes are characterized by spectral density functions (SDFs), which is formally ensemble averages of the intensity of spatial Fourier transformations of the structure realizations. Chapter 3 reviews the most widely used statistical theory, which introduces a hierarchy of differential equations that statistical observables to functions of the structure SDF. While much has been learned from solutions to the fourth-order moment equation that characterizes intensity scintillation, the computation involved is too demanding for interpreting diagnostic measurements. A time-honored simplification is the equivalent phase screen, which concentrates the structure into an equivalent path-integrated phase screen. Under the narrow-angle scatter or parabolic approximation forward propagation is completely specified by the Fresnel scale. The scintillation at a fixed distance from the phase screen is reproduced at a different frequency and propagation distance that keeps the Fresnel scale constant. The FPE becomes the more familiar parabolic wave equation (PWE). Moreover, the scintillation intensity SDF (and scintillation index S4) can be computed a function derived from the structure SDF. The Phase Screen Models for Numerical Computation blog includes a compact summary of the material. Chapter 5 addresses system applications, which include signal processing for scintillation diagnostics. Beacon satellite diagnostic receivers transmit VHF, UHF, and L-band signals. Digital receives generate frequency-dependent amplitude and phase histories. The phase data are dominated by changing range, which can introduce Doppler shifts exceeding 12 kHz. To measure the scintillation component, it is necessary to isolate the Doppler component. One method is to implement a digital phase locked loop (PLL). However, the order of the PLL determines the number of samples used to estimate the frequency or phase. A more robust procedure that allows an arbitrary number of samples is described in the Digital Signal Processing and A Comparison of Phase Locked Loops and Frequency Hypothesis Testing blogs. The blog AGU 2013 Poster and Supplemental Material describes a true tomographic reconstruction, which is mainly of academic interest because of the sampling requirements. Chapter 5 also introduced some diagnostic signal processing procedures and a supplemental MatLab library. Simulated complex scintillation requires no detrending. For plane-wave excitation the average signal intensity is constant, which is most conveniently set to unity. Real intensity scintillation measurements vary because of path-loss associated with changing range and antenna pattern variations. A Butterworth filter is typically used to make a rigid frequency separation between the signal mean and the structure component. One problem with this approach is that the detrend interval should be data driven and an large as possible. While it is true that Fresnel filtering suppresses large scale variation, the cutoff is not rigid and level dependent. We find that wavelet-based filters are easier to implement and more flexible. Simulated phase scintillation requires no detrending. Real phase scintillation data is dominated by the geometric path variation. The problem there is you cannot separate the geometric contribution from total electron content variation, which is the reason navigation satellites use multi-frequency transmissions. These issues will be discussed in separate blog entries. What amounts to a GPS Toolbox, which is an upgrade of resources originally developed for low-earth-orbit (LEO) beacon data, contains orbit prediction from ephemeris elements, magnetic field computation, and GPS coordinate manipulation. Scintillation utilities provide all the geometric transformations needed to accommodate field-aligned geometry dependencies. A wavelet library provides all the MatLab utilities needed for wavelet based detrending and segmentation applications. Processing low orbiting beacon satellite data has been a challenge largely because of the limited vehicle space for a VHF, UHF, L-band antenna system. The effective antenna patterns severely limit range of uniform illumination range with a common phase center. Low SNR, particularly at acquisition severely, constrains phase-locked-loop (PLL) performance. However, with post-pass processing substantially more processing can be devoted to the critical frequency tracking operation. Several schemes have been used effectively to construct a narrow band filter centered on the Doppler frequency defined over a local time segment. An analysis of these procedures was presented in a paper REF. In the paper it was hypothesized but not demonstrated that typical PLL performance was degraded for SNRs below 10 dB to the point that direct frequency estimation was a preferable alternative. The note SoftwarePLL compares frequency estimates derived from a conventional PLL and direct frequency estimation. IES2015Rino is an oral presentation of the new material introduced in the previous post Application of Wavelet Based Analysis to C/NOFS Ionospheric Density Measurements.